Donât miss this cozy home located on one of our beautiful green belts. Boasting lots of outdoor areas featuring many fruit trees and open space for entertaining family and friends. In the front of the home you pass a large open garden area and 2 car garage, a very private lower patio and plenty of space for entertaining. 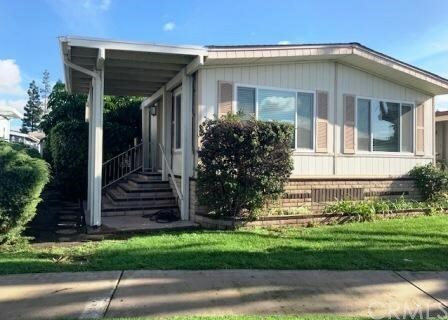 A lovely 2 bedroom, 2 bathroom, 1536 square foot home has laminate flooring and ceiling fans throughout the home, newer vinyl windows through most of the home, earthquake bracing, butcher block laminate counters, newer roof and water heater. A spacious living room and dining room area with vaulted ceilings and greenbelt view offer a private area for entertaining in addition to a family room and kitchen combination. The Groves is a Resident Owned and Owner Occupied Senior 55+ Mobile Home Park in Irvine, Ca. Included in the price is the home and a Share in the Corporation that owns the land; bottom line there is NO SPACE RENT! Community amenities include but are not limited to: pool, locker-rooms & sauna, spa, exercise room, game room with pool tables, ping-pong and shuffleboard table, tennis, basketball, lawn bowling, 9 hole putting green, multipurpose rooms, banquet facilities, beauty salon, 6.5 acre park with BBQs and picnic tables with awnings, gardens, RV storage, high pressure car wash, woodshop and on-site activities coordinator. The list goes on!